Modern-day ECG machines can make accurate measurements and analysis. So why bother to learn how to read an electrocardiogram? The answer is simple: A robotic machine can follow algorithms but it takes a human mind to read beyond and between the waveforms to make interpretation and collate it with clinical findings. Electrocardiography can be the topic of a lifelong study. This Primer is only meant to introduce the subject to medical students, interns, novice residents, and general physicians in community practice. It is hoped the liberal use of diagrams and pictures can help to improve understanding. Under physiological conditions, the sinoatrial (SA) node generates pacemaker impulses that spread to the right and left atria, converge on the atrioventricular (AV) node, and continue down the His bundle and bundle branches (right bundle branch or RBB and left bundle branch or LBB) to activate the ventricles. Depolarization is followed by repolarization and the sequence of depolarization[activation-and-contraction[repolarization repeats itself to generate rhythmical heart beats. Under abnormal conditions, ectopic foci in the atria, the AV junction, and the ventricles can usurp pacing dominance from this node and generate ectopic beats. The wave of depolarization and repolarization described above can be mapped on the body surface by sensing electrodes placed on the extremities and the chest wall. The resultant waveform traced on graph paper is called the electrocardiogram (ECG). Horizontal axis of theECG graph paper represents time in milliseconds (ms) while the vertical axis represents amplitude or voltage in millivolts (mV). Each1-mm-division on the horizontal axis is 40 ms; each 5-mm-division is 200 ms. Two 5-mm-divisions on the vertical axis are calibrated to represent 1 mV. Despite the latter, ECG waves are commonly described by their height in mm rather than by their strength in mV. The heart occupies a position in the center of the thorax anda 12-lead ECG is simply a recordingof the current flux of cardiac depolarization and repolarization obtained from 12 different sites on the body surface. Lead I records from the left at a coordinate of 0o. Lead II records from the foot at a coordinate of 60o. Lead III records from the foot at a coordinate of 120o. Lead aVR records from the right shoulder at a coordinate of -150o. Lead aVL records from the left shoulder at a coordinate of -30o. Lead aVF recordsdirectly from the feet below at a coordinate of 90o. 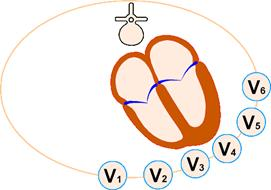 Leads V1 and V2 record the current flux over the right ventricle directly. 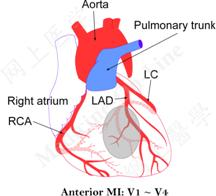 Leads V3 and V4 record directly the electrical activities of the ventricular septum and the anterior wall of the left ventricle. Leads V5 and V6 record the current flow generated by the left ventricle directly. Irrespective of whether it is a limb lead or chest lead, a current surging directly in the direction of the recording electrode will cause a positive deflection on the ECG; a current flowing in the direction but not directly toward the recording electrode will be registered as a positive deflection of lower amplitude; a current running at right angle to the direction of the recording electrode will cause no deflection or a biphasic deflection; a current flowing away in a direction opposite to that of the recording electrode will be registered as a negative deflection; and a current flowing away but not directly will cause a negative deflection of smaller amplitude. Atrial and ventricular depolarization and repolarization are represented on the ECG as a series of waves: the P wave followed by the QRS complex and the T wave. The first deflection is the P wave associated with right and left atrial depolarization. Wave of atrial repolarization is invisible because of low amplitude. Normal P wave is no more than 2.5 mm (two-and-a half1-mm-divisions) tall and less than 120 ms (three 1-mm-divisions) in width in any lead. 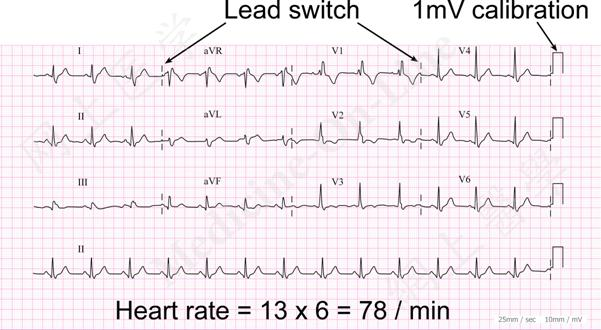 In sinus rhythm when the SA node is the pacemaker, the mean direction of atrial depolarization (the P wave axis) points downward and to the left, in the general direction of lead II within a coordinate between 15o and 75o and away from lead aVR. On this count the P wave is always positive in lead II and always negative in lead aVR during sinus rhythm. Conversely, a P wave that is positive in lead II and negative in lead aVR indicates normal P wave axis and sinus rhythm. 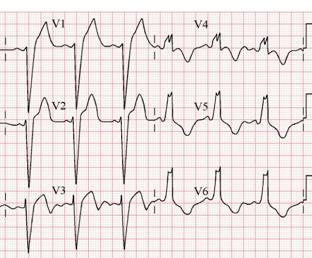 QRS duration is the width of that complex from beginning to end, irrespective of the number of deflections present. Normally it lasts no more than 120 ms (three 1-mm-divisions). The normal QRS axis, like the P wave axis, points downward and to the left within a coordinate between -30o and +90o. 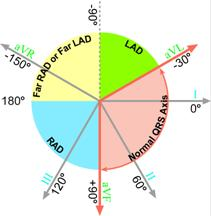 This axis is said to be deviated to the left (left axis deviation or LAD) if it lies between -30o and -90o; and deviated to the right (right axis deviation or RAD) if it lies between +90o and 180o. It is either far right or far left axis deviation if it lies between 180o and -90o. 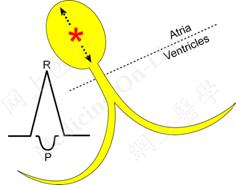 The method of determining QRS axis will be explained in a later section. Following the QRS complex is the ST segment, extending from where the QRS ends (irrespective of what the last wave in the complex is) to where the T wave begins. The junction between the end of the QRS and the beginning of the ST segment is called the J point. ST segment reflects the current flow associated with phase 2 of ventricular repolarization. Since there is no current flow during this plateau phase of repolarization, the ST segment is normally isoelectric with the baseline. The T wave represents the current of rapid phase 3 ventricular repolarization (see diagram above). The polarity of this wave normally follows that of the main QRS deflection in any lead. The ventricles are electrically unstable during that period of repolarization extending from the peak of the T wave to its initial downslope. A stimulus (e.g. a run away heart beat called a premature beat) falling on this vulnerable period has the potential to precipitate ventricular fibrillation: the so call R-on-T phenomenon. The PR interval extends from the beginning of the P wave to the beginning of the QRS, whatever the first wave of this complex may be. This interval measures the time from the initial depolarization of the atria to the initial depolarization of the ventricles and reflects a physiological delay in AV conduction imposed by the AV node. Normal range is 120 – 200 ms (3 to 5 1-mm-divisions) and no longer. 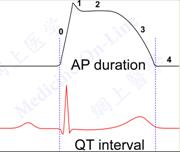 The QT interval is measured from the beginning of the QRS to the end of the T wave. It represents the time in which the ventricles depolarize and repolarize and is a measure of ventricular action potential (AP) duration. This interval should be determined in the ECG lead where it is longest. Normal intervals are < 460 ms for women and < 450 ms for men. But QT values are heart-rate dependent and can vary from 270 ms at a heart rate of 150 beats/min to 500 ms at a heart rate of 40 beats/min. 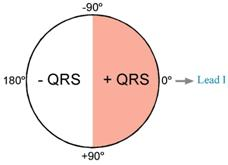 Corrected QT interval (QTc), obtained by dividing the measured QT interval by the square root of the RR interval, can be used in place of raw QT interval. Normal QTc is 440 ms or less. It belongs to the patient you are reviewing. It was obtained on the day and time you requested the examination. Review the patient’s medical history, physical and laboratory findings, diagnosis, and indication of the ECG examination. These pieces of information help to focus your attention when reviewing the tracing. However, to focus attention does not mean developing tunnel vision. You still should review all aspects of the ECG before drawing your conclusion. Make old tracings available for comparison. In medical practice, changes in findings over time are as important as the presence or absence of findings at any discrete moment in time. Primary rhythm: supraventricular (sinus, atrial, junctional) or ventricular in origin. Superimposed abnormalities (escape or premature beats). Right and left atrial abnormalities. 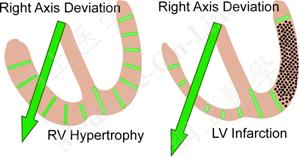 Right and left ventricular hypertrophy. Right and left bundle branch block. Correlate the ECG findings with the patient’s clinical presentation. Treat the patient; not the waveforms. Heart rate of a normal adult patient at rest is between 60 and 100 beats/min. A heart rate slower than 60 beats/min is called bradycardia; a heart rate faster than 100 beats/min is called tachycardia. To determine the heart rate from a recording made by modern ECG machines is relatively simple. These machines make a 12-lead ECG tracing over a 10-second period. One row starts with lead I, switches to aVR to be followed by V1, and ends with V4. A second row starts with lead II and records aVL, V2, and V5 in sequence while a third row records lead III, aVF, V3, and V6 in sequence. Nearly all machines offer continuous recording of lead II in a fourth row and some others offer even more. Despite lead-switching in mid-course, recording is continuous without interruption over the 10-second period. Therefore heart rate per minute can be determined by counting the number of beats on any one row and multiplying this number by 6. The heart rate is 300 beats/min when 2 consecutive QRS complexes are one 5-mm-division (200 ms) apart. By the same token, the heart rates are 150, 100, 75, 60, and 50 beats/min when 2 consecutive QRS complexes are two, three, four, five, and six 5-mm-divisions (400, 600, 800, 1000, 1200 ms) apart respectively. If the distance between 2 consecutive QRS complexes does not equal to a whole number of 5-mm-divisions, a rough estimate of the heart rate will have to be made as shown in the tracing. These rhythm strips have 3-second marks and heart rate is a matter of multiplying the number of QRS complexes in a 6-second period by 10. For very slow heart rates in which there are few QRS complexes in a 6-second interval, accuracy can be improved by multiplying the number of QRS complexes in a 12-second period by 5. Normal cardiac rhythm arises from the SA node (sinus rhythm) but pacemaker impulses can come from ectopic foci in the atria, the AV junction, and the ventricles under abnormal conditions. When an ectopic impulse occurs singly, it generates a beat; when the beat repeats itself, it becomes a rhythm. In addition, ectopic impulses can arise through an escape mechanism or through prematurely. Each of these terms is explained in the sections that follow. Sinus rhythm implies that the SA node is the pacemaker and normal sinus rhythm (NSR) is simply sinus rhythm with heart rate in the normal range of 60 – 100 beats/min. The P waves in sinus rhythm have normal axis and are positive in lead II and negative in lead aVR. The QRS width in sinus rhythm is normal because the ventricles are activated rapidly by impulses conducted down the His bundle and bundle branches. Sinus rhythm is regular with the exception of a phenomenon called sinus arrhythmia during which there is a minimal increase in heart rate during inspiration and a minimal decrease in heart rate duringexpiration. Although arrhythmia means abnormal cardiac rhythm, sinus arrhythmia is truthfully not an abnormal rhythm. In disease (e.g. sick sinus syndrome) the SA node can fail in its pacing function. If failure is brief and recovery is prompt, the result is only a missed beat (sinus pause). If recovery is delayed and no other focus assumes pacing function, cardiac arrest follows. 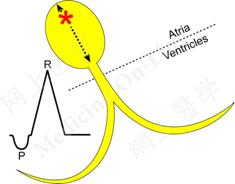 An escape beat is a heart beat arising from an ectopic focus in the atria, the AV junction, or the ventricles when the sinus node fails in its role as a pacemaker or when the sinus impulse fails to be conducted to the ventricles as in complete heart block (see section on “Heart Blocks” below”). The ectopic impulse in this instance is always late, appearing only after the next anticipated sinus beat fails to materialize. If the sinus node failure or heart block is only brief, the ectopic focus may generate only a single escape beat; if the sinus node failure or heart block is prolonged, the ectopic focus produces a rhythm of escape beats to assume full pacing function. This escape mechanism offers protection against total cardiac standstill in the event of sinus node failure or complete heart block. Atria escape, either in escape beat or escape rhythm, produces a P wave that has abnormal axis and looks different from the P wave produced by the sinus beat. 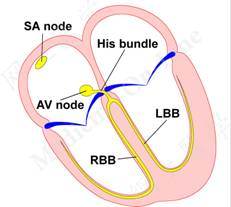 However, depolarization spreads to the ventricles normally down the AV junction, the His bundle, and bundle branches. Therefore the QRS complex of the atrial escape beats looks exactly like the QRS complex of the sinus beat. The inherent rate of atrial escape rhythm is between 60 and 80 beats/min. In junctional (AV junctional) beat or rhythm the atrial depolarization current points cephalad and to the right, away from lead II and toward lead aVR. Therefore the P wave, if seen, would be negative in lead II and positive in lead aVR. However this P wave is usually buried by the QRS complex and not visible. On less common occasions when the P wave is visible, it may be either immediately before or immediately after the QRS complex. Since the impulse is conducted to the ventricles via the His bundle and bundle branches, the QRS complex of junctional beats is narrow and looks exactly like the QRS complex of the sinus beat. The inherent rate of junctional escape rhythm is 40 – 60 beats/min. If the ectopic junctional focus is in the center of the node, the depolarization impulse has to travel an equal distance up and down the node to depolarize the atria and the ventricles. Hence activation of atria and ventricles is simultaneous (conduction down the His bundle and bundle branch is very fast) and the P wave is buried within the QRS complex. If the ectopic focus is high up in the AV node, the depolarization wave reaches the atria before the ventricles and atrial activation precedes ventricular activation. 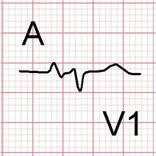 As a result, the P wave is in front of the QRS complex. If the ectopic focus is low down in the AV node, ventricular activation precedes atrial activation and the P wave follows the QRS complex. In ventricular escape beat or rhythm, the depolarization wave spreads slowly via abnormal pathway in the ventricular myocardium and not via the His bundle and bundle branches. Therefore, the QRS complex is wide (>120 ms) and has a shape different from that of the sinus beat. If the ventricular escape rhythm is the result of sinus node failure, no P wave of atrial contraction is seen as in the tracing above. 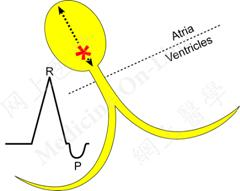 If the ventricular escape rhythm is the result of 3rd degree (complete) heart block, the sinus node paces the atria independently and regular P waves unrelated to the ventricular escape beats can be seen. The inherent rate of ventricular escape rhythm is between 20 and 40 beats/min. A premature beat also arises from an ectopic pacemaker: in the atria, the AV junction, or the ventricles. The non-sinus impulse is early, initiating a heart beat before the next anticipated sinus beat as its name implies. The reason the ectopic focus discharges a pacing impulse early in this instance is because the ectopic focus is irritable and competes with the sinus node. Atrial premature beat (APB) arises from an irritable focus in one of the atria. It depolarizes the atria prematurely (premature to the next timely sinus beat) and produces a P wave that looks different from a sinus-node generated P wave because the direction in which the atria depolarize is abnormal (abnormal P wave axis). Since the premature atrial impulse is conducted in a normal fashion via the AV node, the His bundle, and the bundle branches to depolarize the ventricles, the QRS complex associated with an APB has normal QRS duration and the same morphology as that of the sinus beat. Junctional premature beat (JPB) arises from an irritable focus at the AV junction. The P wave associated with atrial depolarization in this instance is usually buried inside the QRS complex and not visible (see “Junctional Escape” above). However, the P wave may appear on occasions either immediately before or immediately after the QRS complex. When it is visible, the P wave is negative in lead II and positive in lead aVR because of retrograde atrial depolarization. Since the premature junctional impulse is conducted in a normal fashion down the His bundle and bundle branches to depolarize the ventricles, the QRS associated with JPB has normal duration and the same morphology as that of the sinus-node generated beat. Ventricular premature beat arises from an irritable focus in the ventricles. 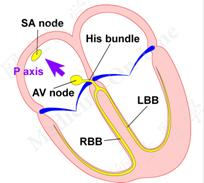 Ventricular premature impulse is not transmitted to the rest of the ventricles along the His bundle and bundle branches. It is conducted along abnormal pathway in the ventricular myocardium. This slow process produces an abnormally wide QRS and bizarre looking T wave. 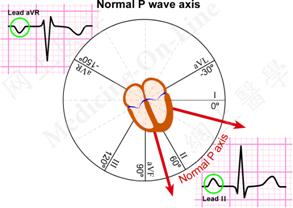 Being a ventricle-generated beat, there is no P wave activity before the QRS complex. If an ectopic focus discharges a premature impulse only occasionally, the result is premature beats superimposed on the basic rhythm; if the irritable focus generates 3 premature beat repeatedly in a continuous sequence, the result is ectopic tachycardia. The run is called non-sustained if it lasts up to 30 seconds and sustained if longer than 30 seconds. Tachycardias, other than sinus tachycardia, can be classified into supraventricular tachycardia (SVT) or ventricular tachycardia (VT), depending on their site of origin. Tachycardias arising from an ectopic focus in the atria or AV junction are called supraventricular tachycardias (SVT). Heart rate is faster than 150 per minute and commonly around 180 per minute. At this very fast heart rate, the P waves of atrial contraction are buried within the waves of the beats before irrespective of whether the tachycardia is of atrial or junctional origin. Differentiation of the two is not possible on the surface ECG and they are simply called paroxysmal supraventricular tachycardia (PSVT) because of their paroxysmal (sudden) onset. Since PSVT impulses depolarize the ventricles by passing down the His bundle and bundle branches, the accompanying QRS complexes are of normal width and have the same morphology as that of sinus beats. In atrial flutter an atrial focus activates the atria at a rate of around 300 times per minute. The baseline of the ECG becomes all P waves, giving it a “saw tooth” appearance in one or more leads. Since it is unusual for the AV node to conduct impulses at a rate faster than 200 per minute, AV block occurs: commonly at a 2 to 1, 3 to 1, or 4 to 1 ratio, yielding a ventricular response rate of 150, 100, or 75 per minute respectively. 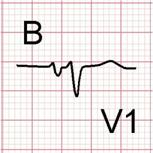 (NB: When the ratio of P waves to QRS complex is 2:1, 3:1, or 4:1 it would be more correct to use the term 2:1, 3:1, or 4:1 conduction rather than block. To avoid confusion, some authors simply use the term 2:1, 3:1, or 4:1 flutter.) Since the atrial flutter impulses depolarize the ventricles by passing down the His bundle and bundle branches, the accompanying QRS complexes are normal in width and have the same morphology as that of sinus beats. Atrial fibrillation is one of the most common arrhythmias in which multiple foci in the atria depolarize rapidly and erratically at a combined rate of 400 times/min or more. Instead of generating well recognized P waves, the atria just quiver and produce fine f waves on the ECG baseline seen in one or more leads. The AV node is constantly bombarded by depolarization impulses but only some of these impulses manage to get through. The ventricular response is totally irregular without discernible pattern (irregularly irregular) generally at a rate between 110 and 180 beats/min. Since impulses that manage to pass through the AV node are conducted down the His Bundle and bundle branches, the ventricles are activated normally and their QRS complexes are normal in width and have the same morphology as that of sinus beats. Ventricular tachycardia (VT) arises from an irritable ventricular focus that discharges premature impulses for 3 or more beats without interruption. The rate of depolarization is 150/min or faster. Since these impulses are conducted to the rest of the ventricles via abnormal pathway in the ventricular myocardium and not via the His Bundle and bundle branches, the QRS complexes are broader than normal and without distinguishable T waves. In monomorphic VT, consecutive QRS complexes have the same appearance. Ventricular fibrillation occurs when multiple ventricular foci discharge rapidly and chaotically. The ventricles twitch asynchronously and are not effective as pumps. No organized QRS complexes are seen—just disorganized oscillatory waves which can be coarse (as shown) or fine in appearance. 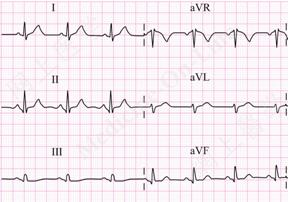 Heart block refers to a pathological delay in AV conduction, either at the AV node or beyond. Signs of heart block lie in the PR interval and P to QRS relationship. In first degree heart block the cardiac rhythm is sinus in origin but the time from the initial depolarization of the atria to the initial depolarization of the ventricles is abnormally delayed. This pathologic delay is reflected in a PR interval longer than its upper limit of 200 ms. 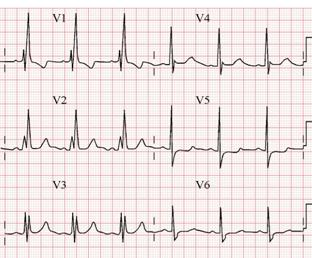 Nevertheless, each P wave of atrial contraction is followed by a QRS complex of ventricular contraction. When transmission of the depolarizing impulse from the sinus node through the AV conduction system of the heart is interrupted intermittently, P wave of atrial contraction is no longer followed by a QRS complex of ventricular contraction in the interrupted beat. This is second degree heart block. There are 2 types of second degree heart block: Mobitz type I & Mobitz type II. In Mobitz type I block there is progressive prolongation of the PR interval, indicating increasing delay in AV conduction, before it fails altogether. When failure in AV conduction occurs, the P wave of atrial contraction is not followed by a QRS complex. After this missed ventricular beat, the PR interval returns to its shorter duration and the cycle of progressive PR prolongation and missed ventricular beat repeats itself. In Mobitz Type II block, a non-conducted P wave not followed by a QRS complex occurs suddenly without progressive prolongation of the PR interval. 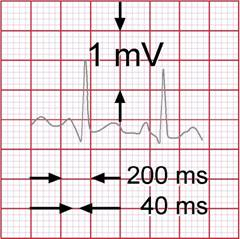 That is, the PR interval, which can be normal or prolonged, is constant before the non-conducted beat materializes. 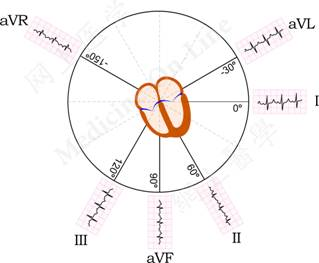 Mobitz type II second degree heart block indicates more serious disease of the conduction system in regions below the AV node and can progress to total failure of AV conduction (third degree heart block) without warning. In third degree (complete) heart block, all the SA node impulses are blocked and not conducted to the ventricles. In the absence of an alternative pacemaker, ventricular contraction comes to a standstill and the patient dies. But most probably an ectopic pacemaker below the block takes over ventricular pacing and the patient survives. Since the SA node and the ectopic pacemaker pace the atria and ventricles independently, the P waves bear no relationship to the QRS complexes. If the block is high in the AV node and the ventricular pacemaker is located lower in the AV junction, the QRS complex is normal in width because ventricular activation is via the bundle branches. If the block is low in the AV junction, the ventricles are paced by an idioventricular pacemaker and the QRS complexes will be widerthan normal because the ventricles are no longer activated via the bundle branches. This topic is covered in a later section. There are many ways to determine QRS axis. The one described below combines simplicity and efficiency. The limits of normal and abnormal QRS axis are summarized in the diagram to the right. QRS axis is the direction in which the mean QRS current flows. The normal axis points mostly downward and to the left because the more muscular left ventricle generates a stronger depolarizing current that overwhelms that generated by the less bulky right. Although both right axis deviation (RAD) and left axis deviation (LAD) are not necessarily associated with organic heart disease, they are seen in a number of settings and their presence can provide added evidence to support a clinical diagnosis. RAD is seen in right ventricular (RV) hypertrophy and in infarction involving the left ventricle (LV). Right ventricular muscle bulk is relatively larger than that of the left in both conditions and generates a stronger depolarizing current in its direction. LAD is seen, but not always, in patients with left ventricular hypertrophy. More commonly the QRS axis is horizontal in this condition. It is only necessary to examine the QRS complexes in leads I and II to determine whether the QRS axis in normal or deviated to the left or the right; a precise calculation of the QRS axis is not required in clinical interpretation of the ECG. It has been explained in a previous section that a current flowing in the direction of a recording electrode (an ECG lead) registers a positive deflection and a current flowing away registers a negative deflection. Therefore, the QRS in lead I would be positive if the QRS current flows in the direction of lead I and negative if away. Similarly the QRS in lead II would be positive if the QRS axis points in the direction of lead II and negative if away. 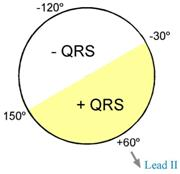 By overlapping the two circles representing leads I and II, it can be seen that the QRS axis is between +90o and -30o and normal if the QRS is positive both in lead I and lead II. QRS axis is between -30o and -90o or deviated to the left (left axis deviation or LAD) if the QRS is positive in lead I but negative in lead II. QRS axis is between +90o and +150o or deviated to the right (right axis deviation or RAD) if the QRS is negative in lead I but positive in lead II. On occasions the QRS complexes in all 6 limb leads are biphasic, neither positive nor negative. In these instances the QRS axis is said to be indeterminate. Look for signs of atrial abnormalities in leads in which the P wave is most prominent: usually lead II, but also leads III, aVF, and V1. In sinus rhythm the right atrial depolarization wave (brown) precedes that of the left atrium (blue) and the combined depolarization waves, the P wave, is less than 120 ms wide and less than 2.5 mm high. In right atrial abnormality, right atrial depolarization lasts longer than normal and its wave extends to the end of left atrial depolarization. Although the amplitude of the right atrial depolarization current remains unchanged, its peak now falls on top of that of the left atrial depolarization wave. As a result, the combined waves of right and left atrial depolarization, the P wave, is taller than normal (taller than 2.5 mm) but its width remains within 120 ms. 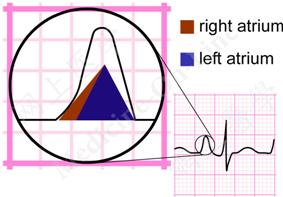 In left atrial abnormality left atrial depolarization lasts longer than normal but its amplitude remains unchanged. Therefore, the height of the resultant P wave remains within normal limits but its duration is longer than120 ms. A notch (broken line) near its peak may or may not be present. A biphasic P wave in V1 is another sign suggesting atrial abnormality. In right atrial abnormality, the initial positive portion of the biphasic P wave is larger than the terminal negative portion. A biphasic P wave in V1, with its terminal negative deflection more than 40 ms wide and more than 1 mm deep is another ECG sign of left atrial abnormality. Look for signs of right and left ventricular hypertrophy in the right chest leads (V1 and V2) and left chest leads (V5 and V6). In right chest leads V1 and V2, the QRS complexes are predominantly negative with small R waves and relatively deep S waves because the more muscular left ventricle produces depolarization current flowing away from these leads. In left chest leads V5 and V6, the QRS complexes are predominantly positive with tall R waves because the more muscular left ventricle produces net current flowing towards these leads. The QRS complexes in V3 and V4 reflect a transition between the right and left chest leads. The normal transition zone, where the R wave and S wave are equal, is between V3 and V4. Early transition may appear in V2 while late transition may not appear until V5 or V6. In V1 the QRS are positive with tall R waves. This is because increased right ventricular muscle mass causes the net ventricular depolarization current to move towards this right chest lead. R wavesthat are taller than S waves are deep in V1 are highly suggestive of RVH. The S waves are unusually deep in V6 and may be even deeper than the R wave is tall. Right axis deviation due to the overpowering current generated by a hypertrophied right ventricle. Unusually tall R wave in left chest leads V5 and V6 and unusually prominent S wave in right chest leads V1 and V2. 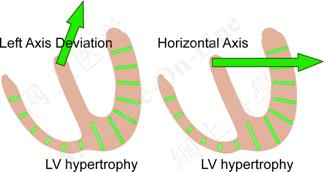 These are exaggerations of the normal configurations due to increase in left ventricular muscle mass. R waves taller than 14 mm in lead I or taller than 11 mm in Lead aVL. However, tall R waves in limb leads and chest leads do not always coexist. Left axis deviation may or may not be present. Signs of left atrial enlargement in leads II, III, aVF or V1 may be present. Left atrial abnormality is the result of having to pump blood into a muscular non-compliant left ventricle. 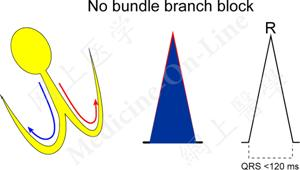 Look for signs of bundle branch block (BBB) in V1 and V6. 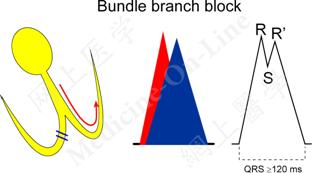 In the absence of BBB, passage of the depolarizing impulse down the His bundle and bundle branches is rapid and activation of the right and left ventricles is simultaneous and synchronous. The individual QRS complexes of the right and the left ventricles superimpose on each other and produce a composite QRS complex that is narrow in width (< 120 ms). In BBB, irrespective of whether it is right or left, activation of the ventricles becomes asynchronous: Depolarization of the ventricle on the blocked side is delayed. This delay causes the individual QRS complex of the blocked ventricle to be wider than normal and appear after the individual QRS complex of the not-blocked ventricle. As a result, the composite QRS complex is > 120 ms wide and has RSR’ waves: the R wave belongs to the individual QRS of the not-blocked ventricle and the R’ wave to the individual QRS of the blocked ventricle. 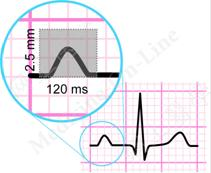 The S wave between the R and R’ waves may be deep and falls below the baseline; it may not be so deep and causes a notch between the R and R’ waves only; or it may be hardly visible such that the QRS complex is simply a tall and wide R wave. 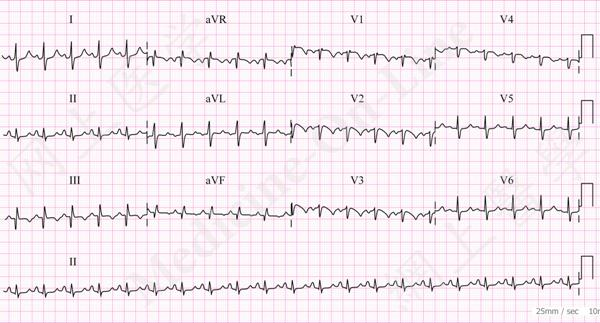 In right bundle branch block (RBBB), the widened RR’ complex is seen most typically in V1. Secondary T wave inversion can also be seen in this lead because when depolarization is abnormal repolarization can also be expected to be abnormal. Since the late right ventricular depolarization current moves away from left chest leads, it shows up as wide S waves in V6. When there is an RR’ complex in V1 but it is less than 120 ms wide, the condition is called incomplete right bundle branch block. In left bundle branch block (LBBB) the widened RR’ complex is seen most typically in V6. Secondary T wave inversion is present in the left but not right chest leads. Since the late left ventricular depolarization current moves away from the right chest leads, it shows up as deep and broad S waves in V1. Bundle branch block or ventricular rhythm? In sinus rhythm with 3rd degree heart block, there are regular P waves that are totally asynchronous with the QRS complexes, which represent escape rhythm from a ventricular focus. In ventricular rhythm with sinus arrest, only wide QRS complexes are seen and P waves are absent. Acute myocardial infarction (MI) affects both ventricular depolarization (appearance of pathological Q waves) and repolarization (ST-T wave changes). Specific manifestations depend on whether the lesion is subendocardial or transmural in location. The ECG sign of subendocardial ischemia is ST segment depression (A). Depression is reversible if ischemia is only transient but depression persists if ischemia is severe enough to produce infarction. 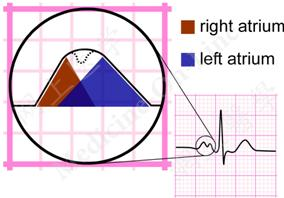 T wave inversion with or without ST segment depression (B) is sometimes seen but not ST segment elevation or Q wave. That is why subendocardial infarction is also called non-ST-elevation myocardial infarction (NSTEMI) and less commonly non-Q wave myocardial infarction. ST segment depression seen in subendocardial ischemia or infarction can take on different patterns: The most typical being horizontal or down-sloping depression. Up-sloping ST depression is less specific. In exercise stress tests, horizontal or down-sloping depression of 1 mm or more (A, B, & C) or up-sloping depression of the same magnitude 80 ms beyond the J point (D) is considered positive signs of ischemia. Up-sloping depression of less than 1 mm at 80 ms beyond the J point (E) is simply J point depression and not ST segment depression. 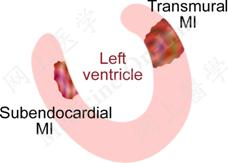 In transmural MI, ischemia in the subendocardium spreads to the epicardium and involves full thickness of the myocardium. 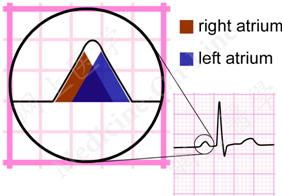 In the acute phase, the ECG signs are ST segment elevation. The elevated ST segment may slope upward or be horizontal or dome-shape. Hyperacute (tall positive) T waves may precede ST segment elevation (A) or seen at the same time with ST elevation (B) during this acute phase. Hours to days later during the evolving phase, pathological Q waves appear, the elevated ST segments return towards baseline, and the T waves become inverted. Q wave is normal if it is shallow and brief (A). Q wave is pathological if it is wider than 40 ms or deeper than a third of the height of the entire QRS complex (B & C). Significant Q wave usually persists even after recovery. By way of their position, the 12 ECG leads can be used to distinguish myocardial infarction occurring in different regions of the heart. The chest leads cluster around the heart in the horizontal plane and look in from the front (V1 to V4) and from the left (V5 and V6); leads I and aVL also look in from the left while leads II, III, and aVF look in at the under surface. Signs of anterior MI (grey area), territory supplied by the left anterior descending coronary artery (LAD), are seen in V1 to V4. 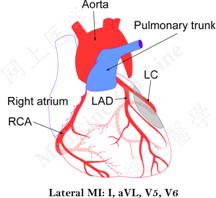 Signs of lateral MI (grey area), territory supplied by the left circumflex coronary artery (LC), are seen in leads I, aVL, V5 and V6. Signs of inferior MI (grey area), territory supplied by the right coronary artery (RCA), are seen in leads II, III, and aVF. Signs of posterior MI on a 12-lead ECG are not the characteristic ST elevation and Q waves, which would be the case if there is a lead recording from the patient’s back. Since V1 and V2 are attached to the patient’s front, they will record changes reciprocal to changes seen from the back, which are ST depression and tall R waves. These uncharacteristic signs make the diagnosis of posterior MI difficult without heightened vigilance. Suffice it to say, pure posterior wall infarctions are rare. Most extend to involve the inferior wall or lateral wall and leads II, III, and aVF should be examined for characteristic signs of this extension in the former and leads I, aVL, V5 and V6 in the latter. The presence of LBBB complicates the ECG diagnosis of acute MI. 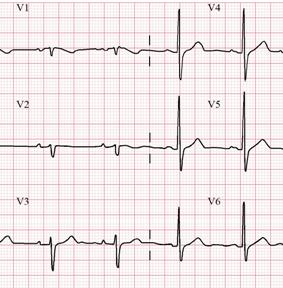 This is because LBBB alone can produce signs that may be confused with those of infarction: deep QS waves in the right chest leads and ST depression and T wave inversion in the left chest leads. Furthermore, the Q wave of left ventricular MI may be buried within the widened QRS complex. Therefore, the diagnosis of acute myocardial infarction should be made circumspectively in the presence of pre-existing LBBB. On the other hand, the appearance of new LBBB should be regarded as sign of acute MI until proven otherwise. Serum potassium is the major intracellular ion that participates in the depolarization and repolarization of myocardial cells. Hence its serum concentration has a profound effect on the QRS and ST-T complex. 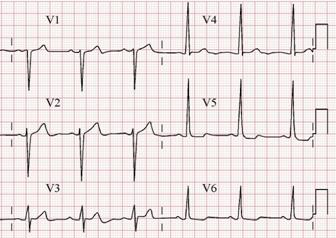 Narrow and tall peaked T wave (A) is an early sign of hyperkalemia. It is unusual for T waves to be taller than 5 mm in limb leads and taller than 10 mm in chest leads. Hyperkalemia should be suspect if these limits are exceeded in more than one lead. As serum potassium concentration continues to rise, the PR interval becomes longer, the P wave loses its amplitude and may disappear, and the QRS complex widens (B). When hyperkalemia is very severe, the widened QRS complexes merge with their corresponding T waves and the resultant ECG looks like a series of sine waves (C). With hypokalemia, the T wave becomes flattened together with appearance of a prominent U wave. The ST segment may become depressed and the T wave inverted. Unlike hyperkalemia, these additional changes are not related to the degree of hypokalemia. ECG signs of hypercalcemia and hypocalcemia may not be obvious even in patients who have deranged plasma calcium concentrations that are clinically significant. If they are present, hypercalcemia is associated with short QT interval (A) and hypocalcemia with long QT interval (B). Interval shortening or lengthening is mainly in the ST segment. Digoxin is a potent pro-arrhythmic drug. At therapeutic plasma level, it causes nonspecific ST segment depression that has a scooping appearance (A) or looks like a reversed “ ̈” (B). 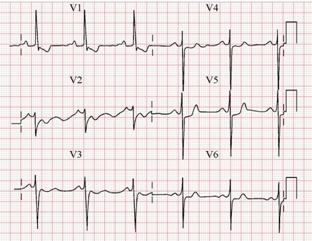 (See Case 067: Abnormal ECG at http://www.medicine-on-line.com.) At toxic levels, digoxin can cause virtually all kinds of arrhythmia but particularly sinus bradycardia, SA and AV blocks, atrial and junctional tachycardias, and VPB and ventricular tachycardia. Quinidine, procainamide, and disopyramide (Class IA agents) prolong the QRS duration and the QT interval with or without the appearance of U wave and have the propensity to cause polymorphic ventricular tachycardia (torsade de pointes). Sotalol and amiodarone (Class III agents) can increase PR, QRS, and QT intervals, leading to similar risks of torsade de pointes. They also have significant beta-blocking properties, causing bradyarrhythmias. Sinus tachycardia and atrial and ventricular ectopic beats. Right ventricular strain pattern with inverted T waves in right chest leads. Incomplete or complete right bundle branch block pattern. But all these ECG signs may not be present even in frank pulmonary embolism.